Use the iMODELER to gain insights, explore how things are interconnected and enhance your brain’s capability to tackle complexity. It will make you become more successful. The new iMODELER offers a revolutionary way to both visualize and analyze (via its unique Insight Matrix) complexity, thus allowing for better planning, decision-making and communication. The iMODELER even allows for quantitative (e.g. system dynamics) modeling of scenarios. You can “imodel” politics, economics, management practices (e.g. systemic change management), complex projects (systemic project management), strategies (systemic strategy development), process optimization (OR), family matters, your work-life balance and plenty more to foresee what might happen in the future and to identify the best form of action for success. 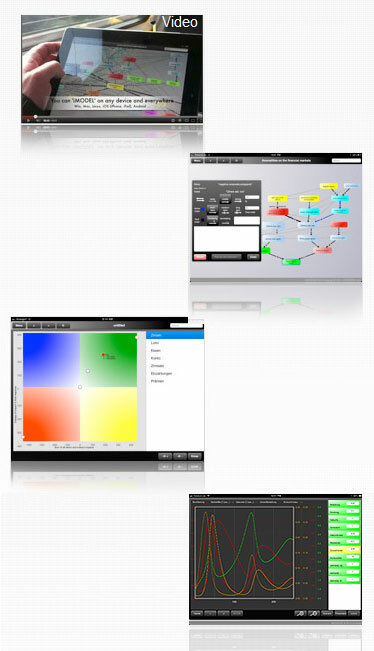 The iMODELER runs on all modern devices (PC, Mac, Linux, iPhone, iPad, Android, etc.) with a modern browser. You can also use your own personal iMODELER cloud, share your models and even model collaboratively with others. And it is great fun to use, too!